Hey-o! I'm Kelly from Mucho Mucho Bueno Bueno. A couple weekends ago I had the opportunity to go to Austin City Limits. If you haven't heard of it, it's a rad music festival that takes place here in Texas. I don't know about you, but at a festival I want to carry the least amount of 'stuff.' 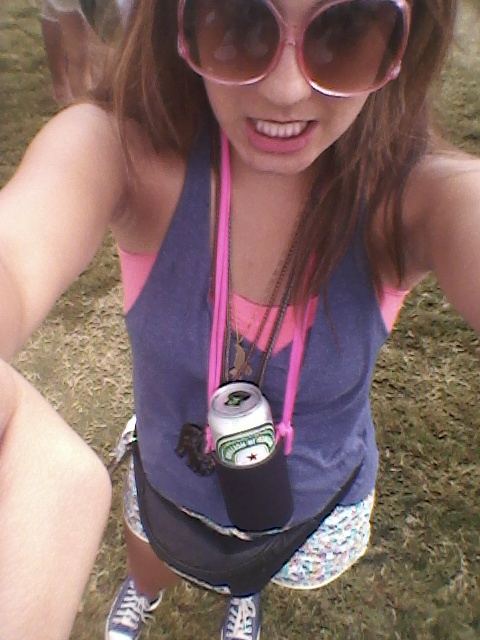 If you are a gal at ACL, you probably have a purse of sorts and if you're a dude, you probably have a backpack. If you're a blogger like me then you'll have a camera added to the mix. The last thing I want to do at this point is hold something in my hands that I'll just have to hand off to someone in order to take a photo. This is why the Party Koozie is such a beautiful thing. Whether you are drinking water, beer, juice or whiskey, you'll find this useful. 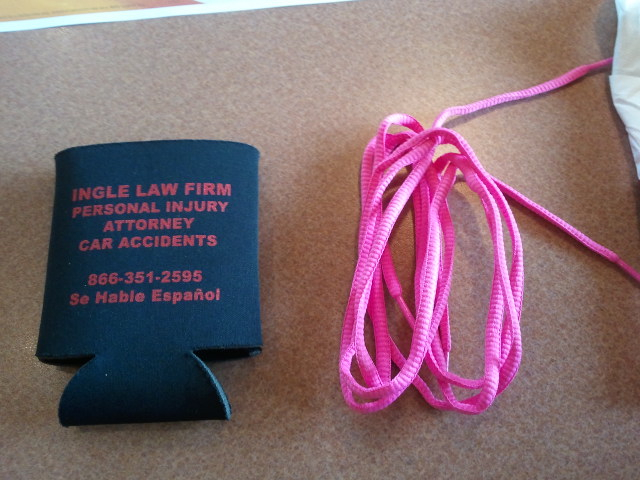 All you need to make this is a Koozie of sorts (this one was free... want to guess why? ), shoe laces, and scissors. It's so easy, I made it at the breakfast table before heading out to the festival. 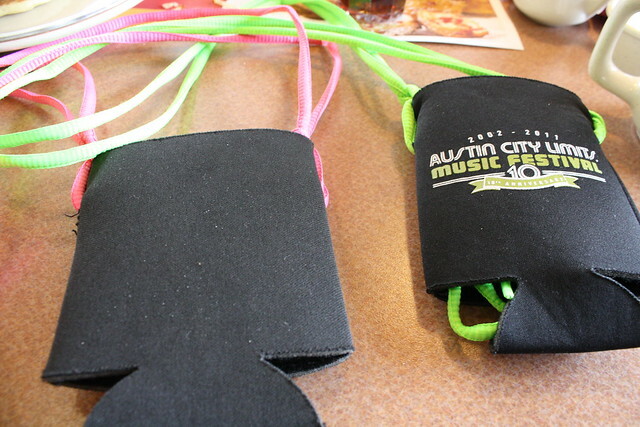 Step one: cut two small slits, one on each side of the koozie. Step two: take two shoelaces (you can do it with one, but it may make your neck sore) and loop them through the two slits. 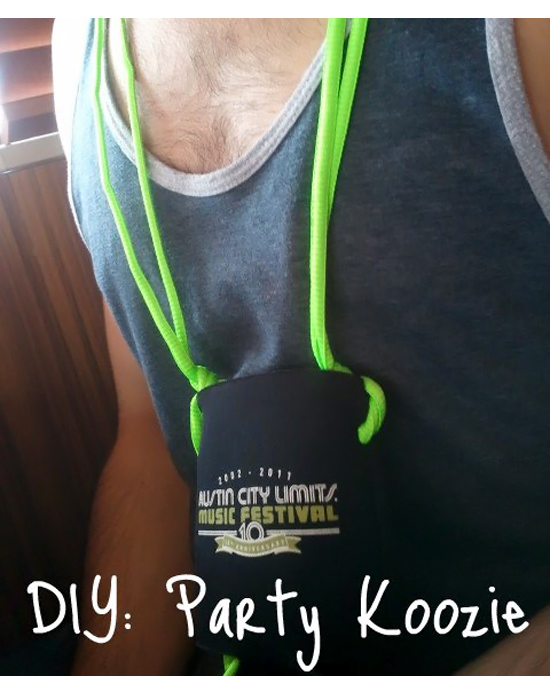 Measure out how far down you would like the Party Koozie to hang and double knot the laces. Best. Idea. Ever. Big thanks to Kelly for sharing this awesome tutorial with my readers while I'm knee deep in wedding week madness! I'm a huge music festival goer, and this will come in handy next summer. It would have also been great for my bachelorette party! Make sure you pay a visit to Kelly and her sister Brandy's rockstar blog, as well as their super badass accessory shop. ha-ha! that was a fun idea. i was at ACL too. has it really been 2 wks. ago? geesh! hahaha this is awesome and wayyy better than the ones my friends and i tried to make! This is awesome!! Totally making one!